STEVE EMBER: Welcome to the MAKING OF A NATION -- American history in VOA Special English. This week in our series, Kay Gallant and Harry Monroe tell the story of that election. KAY GALLANT: Many Americans wanted a gold standard. They said the United States should support its money only with gold. A gold standard, they said, would keep the value of the dollar high. These people were called "gold bugs." Most were businessmen, bankers, and investors. Many other Americans wanted the United States to support its money with both gold and silver. They thought the value of the dollar was too high. A high dollar, they said, drove down prices for agricultural products. A silver standard would lower the value of the dollar. These people were called "silverites. "Most were farmers, laborers, and owners of small businesses." HARRY MONROE: The debate over gold and silver was especially important because of an economic depression that began in the United States in eighteen ninety-three. Thousands of banks and businesses closed. Millions of men lost their jobs. Foreign investors withdrew their money from America. Americans who had money were afraid to invest it. Many people believed the depression would end if the government issued more paper money backed by silver. President Grover Cleveland disagreed. And he opposed any legislation that might threaten the gold standard. He noted that every major nation supported its paper money with gold. The United States would be foolish, he said, not to do the same. It could not stand apart from the world's other money systems. KAY GALLANT: President Cleveland belonged to the Democratic Party. By eighteen ninety-six, many Democrats had become silverites. They gained control of party organizations in several western and southern states. They called Cleveland a traitor to his party and to the American people. They did not want him to be the party's candidate in that year's election. The Republican Party also was divided over the issue of gold and silver. Some members from silver-mining states in the west left the party. Others remained in the party, but gave support secretly to silverite Democrats. Republicans had done well in the congressional elections of eighteen ninety-four. They won control of both the Senate and House of Representatives. Party leaders were sure a Republican could be elected president in eighteen ninety-six. 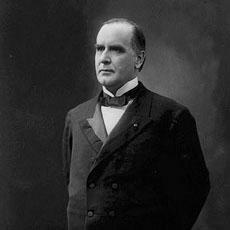 The most likely candidate appeared to be Governor William McKinley of Ohio. HARRY MONROE: McKinley was, in fact, nominated on the first ballot at the Republican convention in St. Louis, Missouri. The Democratic Party held its nominating convention in Chicago, Illinois. The most likely candidate was Congressman Richard Bland of Missouri. A majority of convention delegates, however, were silverites. And they expected to nominate a silverite candidate. Supporters of President Cleveland wanted to test the silverites' strength. They demanded a debate on the gold-silver issue. Several men spoke in support of President Cleveland and the gold standard. Several spoke in support of silver. The last to speak was Congressman William Jennings Bryan of Nebraska. He had led an unsuccessful fight in Congress to keep America using silver. KAY GALLANT: Bryan spoke emotionally during the convention debate. He said he represented America's farmers, laborers, and small businessmen who wanted a silver standard. Bryan ended his speech with a line that became famous during the campaign. It called to mind the torture and death of Jesus Christ. Bryan said gold supporters could not force their money system on silver supporters. "You shall not," he said, "crucify mankind upon a cross of gold." With those words, William Jennings Bryan won the nomination away from Congressman Bland. He would be the Democrats' presidential candidate. He was just thirty-six years old. HARRY MONROE: A number of Democrats refused to accept Bryan as their candidate. They withdrew from the Chicago convention and held one of their own. They called themselves National Democrats. They nominated candidates for president and vice president. But they did not win many votes in the election. America's third party at that time -- The People's Party -- had a difficult decision to make. Populists, as they were called, agreed with silverite Democrats that the United States should have a silver standard. So, some believed the party should unite with the Democrats to support democratic candidate William Jennings Bryan. If they did not, Republican William McKinley was sure to win the election. Other populists feared that such a union would mean the end of the People's Party. The populists solved the problem at their nominating convention. Like the Democrats, they chose Bryan to be their candidate for president. But they chose a different candidate for vice president. In this way, William Jennings Bryan was able to run for president at the head of two separate political parties. KAY GALLANT: There was a great difference in the way the two presidential candidates campaigned. William McKinley refused to travel. Instead of going to the voters, he let the voters come to him. And they did. Railroad companies supported McKinley. They ran special trains to his home in Ohio. The trip was free. Each trip was the same. A band met the train and marched with the group to McKinley's home. McKinley came outside to hear a statement of support from the leader of the group. Then he made a short speech and shook hands. The group left and another one came. On one day of the campaign, McKinley met thirty groups this way. That was more than eighty thousand people. HARRY MONROE: While McKinley stayed at home, William Jennings Bryan travelled. He visited twenty-seven states and spoke to five million people. Bryan explained that he had to travel, because the Democratic Party did not have enough money to campaign in other ways. Bryan spent six hundred fifty-thousand dollars on his campaign. McKinley spent three-and-a-half-million dollars. Bryan's main campaign idea was that the gold standard would ruin America's economy. 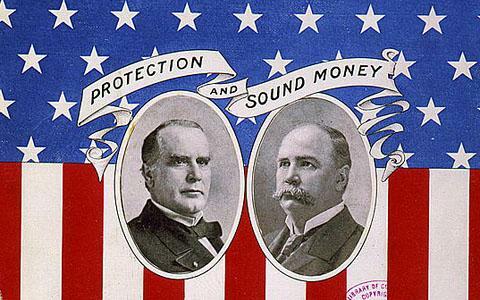 McKinley's main campaign idea was that silver money would ruin the economy. For a time, Bryan's campaign seemed to be succeeding. More and more people promised to support him. Then, in the final weeks before election day, the situation began to change. The depressed economy showed signs of improving. The price of wheat rose for the first time in several years. Perhaps, people said, it was wrong to blame gold for the depression. Perhaps, they said, the ideas of William Jennings Bryan were wrong. KAY GALLANT: On election day, it was soon clear who had won. McKinley received two hundred seventy electoral votes. Bryan received one hundred seventy-six. Bryan congratulated McKinley. Then he told his supporters to begin getting ready for the next presidential election. "If we are right about silver," Bryan said, "we will win four years from now." HARRY MONROE: McKinley's election seemed to give new life to the American economy. Within a month, a business publication reported that buying and selling had increased greatly. It said demand for goods had led to the re-opening of factories closed during the depression. At the same time, new supplies of gold were discovered in Alaska, Australia, and South Africa. The extra gold increased the supply of money in the same way silver would have increased it. Taxes on imported goods rose to almost sixty percent. Under this protective tariff, American industry grew fast. The depression ended. KAY GALLANT: The economic depression of the eighteen nineties forced Americans to worry first about developments at home. But there were a number of international developments then which involved the United States. STEVE EMBER: Our program was written by Frank Beardsley. The narrators were Kay Gallant and Harry Monroe. You can find our series online with transcripts, MP3s, podcasts and images at www.unsv.com. You can also follow us on Facebook and Twitter at VOA Learning English. Join us again next week for THE MAKING OF A NATION -- an American history series in VOA Special English. god love humam ,and mam find gold.right or not also .living going too.